Article first published as TV Review: THE GOOD DOCTOR on Seat42F. ABC premieres yet another medical drama tonight, one of the most common types of shows made. This one, called THE GOOD DOCTOR, follows a young man named Shaun Murphy, who has Autism and Savant syndrome. Shaun is hired as a pediatric surgical resident at San Jose St. Bonaventure Hospital. Most of the staff, including the head of surgery, do not want him there, feeling his limited ability to recognize and express emotion will make it impossible for him to be proficient at the job. But with strong support from the president of the facility, Shaun is allowed to give it a go. Shaun is played by Freddie Highmore, a brilliant actor who is fresh off a starring role in the series Bates Motel. Highmore makes Shaun as interesting and well-developed as his Norman Bates was, and it is immediately clear that Highmore will do a great job. Joined by the excellent Richard Schiff (The West Wing) as Aaron Glassman, the aforementioned president, as well as several other capable, sometimes terrific, actors, it seems there is the framework in place for a very solid show. 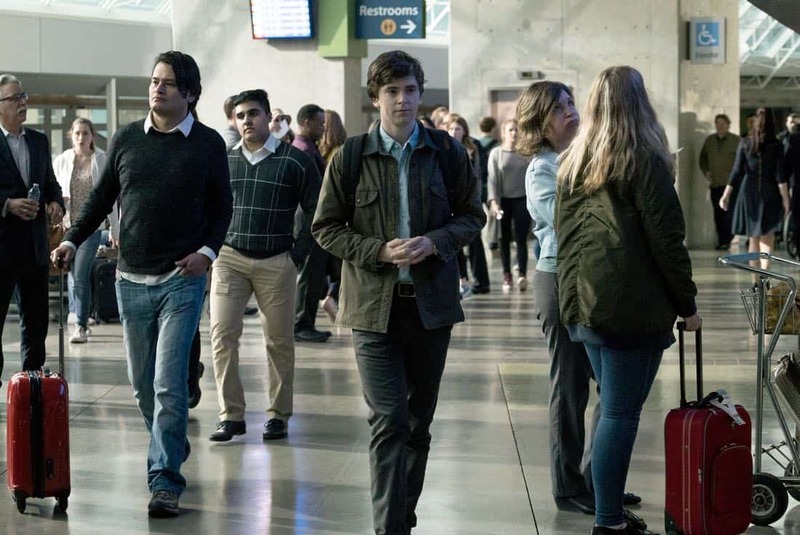 Furthering the points in THE GOOD DOCTOR’s favor is the creative team behind it. This show is based off of a successful South Korean series, and was developed for the U.S. by David Shore (House) and Daniel Dae Kim (Lost). Shore definitely knows something about making strong dramas in the genre, and Kim is well respected as a performer, which sometimes makes for a good guiding hand in production. Here’s where the review takes a turn, though. Despite everything working in its favor, THE GOOD DOCTOR is merely the adjective the title uses – good. You may ask, what’s wrong with good? Indeed, many merely good series are watched by a great number of people week after week, year after year. But this is 2017, the era of peak TV, and there are many, many more innovative, complicated, and compelling options available. Good is no longer good enough. There are plenty of factors working against THE GOOD DOCTOR, starting with how the story is very cliché. Despite being somewhat character-driven, it appears poised to feature mainly stand-alone episodes. The way Shaun’s thought process is depicted is a step above what House did, graphically speaking, but not unusual when compared to other, more recent series. The climax feels forced, and the resolution, unrealistic. Characters are almost two-dimensionally against Shaun for the wrong reasons, and viewers are hand-fed manipulative emotional scenes. So what could THE GOOD DOCTOR have done better? Well, let’s start with the other characters having more nuanced opinions of Shaun. Why be so certain he’s going to fail before a person has even met him? Or worse, once they see Shaun impressively figure out a tough puzzle, why do they still write him off so quickly? In stark contrast with Highmore’s performance, it’s glaringly bad. It would also be interesting if the show was more focused on communicating Shaun’s experience, rather than using it as set dressing against a more mediocre storyline. The one thing it probably could not have done better is choose better actors, and that’s probably why I’m so disappointed. We have enough melodrama on TV, and there are plenty of fine thespians to handle those. With people the likes of Highmore and Schiff, far above average, the project could and should have had more weight. In fact, the thing I would most relate this show to is a formulaic, feel-good Disney film about overcoming diversity, with the struggle simplified to a sugar-coated, nutritionally-lacking, tasty but unsatisfying snack. This is the television version of that. Airing on Disney’s ABC, that might work out for it. But for the discerning viewer who only has time for high quality and freshness, this won’t make the cut. THE GOOD DOCTOR premieres tonight at 10 ET on ABC.